The Confederacy's finest: Walthall in his famous role. his players. Walthall center in dark coat (Thanks Hulda!). One summer day in 1909, Henry B. Walthall left the Player's Club in New York to find his friend James Kirkwood at the request of a producer. He was met at the Kirkwood residence by Mrs. Kirkwood who told him her husband was working in films. Walthall was shocked at this news as motion pictures were not considered a noble line of work in those days. "I can't tell you how I felt," Walthall recalled, "An actor of the legitimate descending to the pictures was beyond me. I told my friend's wife as much. She smiled and said her husband was very enthusiastic. Wouldn't I wait for him? I waited, and when he came home, I saw a man aflush with a new idea in which he took delight. He bubbled about pictures, and I caught a glimpse of what he felt, altho (sic) I still felt sorry for him" (Ames, pg. 140). A Convict's Sacrifice, released July 26, 1909. The next day, out of curiosity, Walthall went to the Biograph studio with Kirkwood. 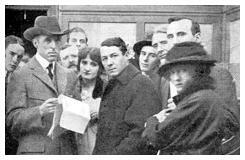 There he met the legendary director D.W. Griffith. Being the type of actor he was looking for, Griffith asked Walthall to be in the film with Kirkwood. Reluctantly, Walthall agreed. Part of the role turned into a practical joke. 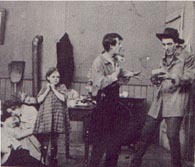 Walthall's character was to dig a ditch until a girl playing his daughter comes with a dinner pail and asks him to share his meal with an ex-convict who is passing through (played by Kirkwood). Eyes on his work, Walthall continued to dig the ditch for some time until, exhausted, he demanded to know when the girl was to arrive with the dinner pail. Griffith responded, "Not much longer, just until you dig to that stone there. I promised the contractor that if he would let us use this ditch you would extend it three feet" (Katchmer). Walthall finished his role in A Convict's Sacrifice and was offered a salaried position as a player in the Biograph company. It paid the same as his theatre work without the traveling expenses. Still, Walthall was not sold on the motion picture career and set off for England with Miller's company in another run of The Great Divide. The play was not the success it was expected to be and Walthall returned to New York finding Griffith's offer still open. This time, Walthall accepted. As Walthall recalled in 1934, "With the exception of a year in vaudeville and a year on the stage, I have been in pictures continuously ever since 1909. If I'm lucky, I'll be in them until I drop" (Hill, pg. 56). The stage actor definitely changed his attitude on the potential of film as a career since the day he hoped to "rescue" his friend James Kirkwood from the ignominious profession. "I have found a new medium of expression with the same general lines as the drama has, but with something else that is its own," admitted Walthall in 1916. "There is art, a great deal of art, in pictures" (Ames, pg. 140). In D.W. Griffith, Walthall found the premiere artist of this "new medium" to guide him. Soon, he would be in scores of Griffith shorts, developing the emotional, yet restrained style of acting that would make him one of the most popular stars of the silent screen. Stardom, however, was not to be expected in the early days of film. As Walthall remembered, "The films were a true democracy then. Everyone, extra, characterman, leading lady was paid the same [$5 a day in 1909]. There were no stars. One day a man played the hero, the next day he was shaking his fist in the mob, a girl was sometimes the mistress and sometimes the maid" (Donnell, pg. 40). Moreover, the actors did not receive the credit of even having their names on the screen. "There wasn't much incentive to our picture acting, for our names were not mentioned in the casts," Walthall reminisced in 1931. "We all bore numbers or fictitious names given us by the public...The producers simply wouldn't let us have that publicity. They were afraid we would ask for more money and that the other companies would steal us away from them. If anybody wrote in asking who a certain player in a picture was, the only answer the ardent fan would get was a number!" (Kingsley, pg. 76). in Ramona, released May 23, 1910. The Biograph crew left New York for California to take advantage of the abundant sunlight. Soon after, Walthall starred in the first two-reeler entitled Ramona which was also the first motion picture version of a novel. Running a full thirty minutes, double what most shorts ran at the time, Ramona was greeted with much enthusiasm from the Biograph company (Kingsley, pg. 77). Future parts for Walthall would be even bigger, especially in 1914. The four-reeler Gangsters of New York received much publicity in the movie fan magazines of that year (i.e. "Chats with the Players," Motion Picture Magazine, April 1914). 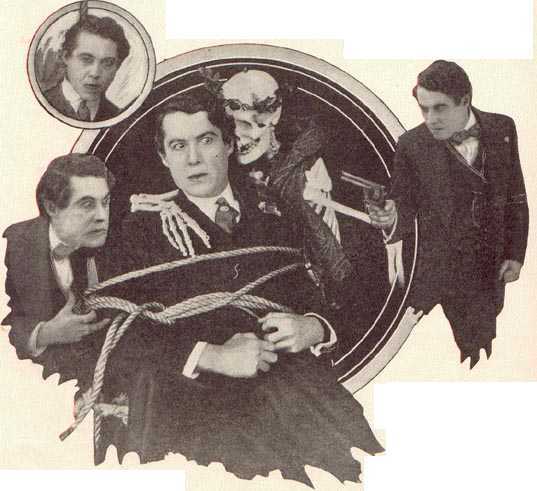 A 1914 issue of Reel Life (actors earning their public recognition the year before) pictured Walthall four times for his roles in The Mysterious Shot (directed by fellow actor Donald Crisp) and The Floor Above (directed by old pal Kirkwood). These films did not even represent Walthall's most memorable roles of 1914. The Griffith classics Judith of Bethulia (the last film for the Biograph company), Home, Sweet Home, and The Avenging Conscience made Henry B. Walthall a star. Kirkwood directed The Floor Above. John Howard Payne setting out to make a name for himself. In Home, Sweet Home, Walthall played John Howard Payne, whose famous song of the same name as the film's title is shown to have helped so many lives as to atone for the songwriter's own sins. Coincidentally, young Henry played this song as his closer in his serenades in Alabama (Williamson, pg. 87). Holofernes, the evil warrior in Judith of Bethulia, was a role Walthall, himself, did not think he could play. The reason was a familiar one to 'Wally.' Perhaps the main cause for Walthall's lack of success on the stage was his height. In 1929 the actor lamented, "I never got very far in the theatre. Stock companies and touring companies were my limit. I was with one show--'Under Southern Skies'--for four years. My greatest stage disappointment came from my size. Can you imagine what it is to rehearse a part and know that you are doing well, and then to have someone say: 'Your work is all that could be desired, and we would keep you in this--if you were only an inch or two taller!'" 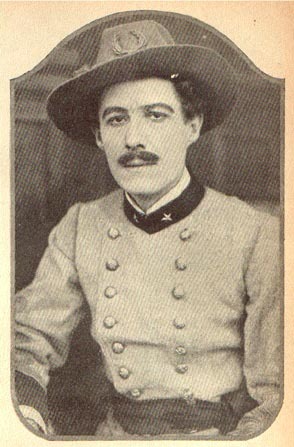 (Hayden). But Walthall's diminutive stature was never an issue for Griffith. Walthall recalled, "I hadn't expected to play Holofernes because I wasn't the type physically. I stayed away from the studio, but Griffith sent for me. I said, 'I can't play the part; I'm too much of a shrimp.' But he had tried out a lot of actors, and finally decided that I could do the part to suit him better than anybody else could. So he found a way, just as he always did. He put me on a pedestal and put brass armor on me. I looked like a giant. I stayed up there either on my throne or on a couch all the time. I had two broadswords, and I threw those broadswords around like a giant. The only other time you saw me I was riding in a chariot across the battlefield and, of course, that made me look tall. No, Griffith never said to me, 'You're too small!'" (Kingsley, pg. 102). So, the 5'6 135 pound actor played the mighty Holofernes, projecting "the austere and commanding presence of a warrior" (Singer, pg. 56). The Avenging Conscience in collage form. 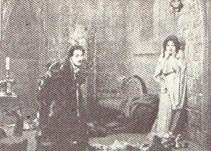 Then came The Avenging Conscience which provided the format for one of Walthall's most celebrated performances and may, alone, have earned him the title of "Edwin Booth of the Screen." Several articles, one as late as 1997, attest to its greatness. Based loosely on Edgar Allan Poe's "A Tell-Tale Heart" and "Annabel Lee," Walthall's character, angry that his sweetheart is not accepted by his uncle, dreams of strangling his uncle to death and stuffing the body behind a wall. While being questioned by authorities, the noises he hears and the visions he sees cause him to lose his grip on reality. In a 1916 article, one admirer wrote, "His [Walthall's] great performance was, to my mind, in "The Avenging Conscience"--a marvel of character-drawing and of the dragging forth of the innermost emotions. In this Walthall was almost uncanny, and every movement of the man--the twitch of the lips, the eloquent changes of the eyes, the hands, even the feet--was caught by the audiences with painful reality" (Willis, pg. 56). Eighty-one years later, Richard Schickel chose The Avenging Conscience as the film to illustrate Walthall's acting expertise. Schickel explains Walthall's mastery in the interrogation scene: "Walthall (and the audience) sees visions which he reacts to, but cannot overreact to, since it would signal to the detective that he is on the right track and should continue harassing this strange young man. Slowly, Walthall comes apart psychologically; a medium close-up of his oddly smiling yet troubled face, in conversation with himself, reveals that he has inevitably lost control. A lesser actor might have gone for a more demonstrative or affected style of performance; Walthall is genuinely terrifying-- as he is terrified--because he is restrained and works with the power of films' visual capacity to represent (un)reality" (pg. 57). 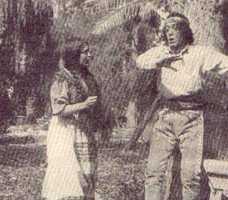 As memorable as this role was, the pinnacle of Walthall's success came when D.W. Griffith selected him to play the lead in his upcoming masterpiece, The Birth of a Nation. As with Holofernes in Judith of Bethulia, Walthall did not believe he was physically suited for the role of Col. Ben Cameron. 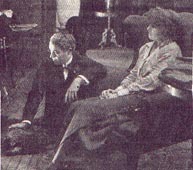 Walthall preferred to play Governor Stoneman, a part that made up much of the play's version. Griffith, however, believed Walthall, with his subtle yet powerful body language and angry, expressive eyes, was perfect for the role and the director would make Ben Cameron "the outstanding part in the picture" (Kingsley, pg. 102). In addition, Walthall's expert knowledge of Civil War history and his prowess as a horseback rider convinced Griffith to make his leading actor an assistant director to oversee some of the battle scenes. Several sources explain that, due to "illness," Walthall was almost unable to undertake his famous role; one source going so far as to claim that Walthall was "not expected to live" (Rankin, pg. 96). The 6'3 Wallace Reid was on call just in case his services as the not-so-little colonel were needed. This "illness" is never given a name. Some mysterious "illness" also, according to period magazine clippings, sidelined Walthall from work a few times in his later life. Perhaps repercussions from the malarial fever he suffered while in the Army are to blame or possibly the illnesses were more self-imposed. Several firsthand accounts show that Walthall had at least some issues with alcohol, sometimes disappearing from the studio for days at a time. 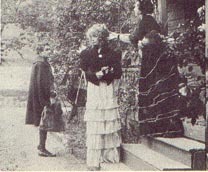 Lillian Gish in The Movies, Mr. Griffith, and Me explained that a bodyguard was assigned to 'Wally' to assure he arrived at work on time and did not imbibe excessively. Once, he gave his bodyguard the slip and was found later napping in his hotel room (pg. 135). Such shenanigans are disheartening, especially considering that Walthall was 36 years old at the time. The story may help explain the many references to some unnamed "illness" that often creeps up in articles on Walthall. This information also demonstrates just how great an acting talent Walthall was considering that the legendary director put up with such anxiety in order to have Walthall play the lead in his greatest film. Click here for the exciting conclusion (well, not too exciting).